1دانشجوی دکتری جغرافیا و برنامه ریزی روستایی، دانشگاه فردوسی مشهد. انتخاب الگوی کشت مناسب به‌ویژه کشت محصولات دارای ارزش بالا نظیر زعفران، نشان می‌دهد که الگوی کشت این محصولات می‌تواند دستیابی به اهداف برنامه‌های توسعه روستایی را تسهیل کند. در سال‌های اخیر، کشت محصول زعفران در بخش‌هایی از شهرستان نیشابور همچون دهستان اسحق‌آباد، رشد قابل‌توجهی داشته، به‌نحوی‌که باعث تغییر الگوی کشت از پیاز به زعفران شده‌ است. هدف این تحقیق شناسایی عوامل مؤثر بر گسترش الگوی کشت زعفران و آثار و نتایج اقتصادی و اجتماعی آن در دهستان مذکور است. روش تحقیق در این پژوهش توصیفی تحلیلی بوده و از منابع کتابخانه‌ای و میدانی نیز برای جمع‌آوری اطلاعات استفاده شده ‌است. حجم نمونه بر اساس فرمول کوکران مشتمل بر 220 زعفران کار دهستان اسحاق‌آباد در سال 1392 محاسبه و به روش تصادفی ساده انتخاب و نتایج نیز با ضریب همبستگی پیرسون تحلیل شد. نتایج این تحقیق نشان می‌دهد که عوامل جغرافیایی و جاذبه‌های بازار مصرف، مهم‌ترین فاکتورهای گسترش الگوی کشت زعفران در منطقه بوده است. به‌منظور حفظ این پتانسیل بومی و نیز برنامه‌ریزی برای گسترش الگوی کشت این محصول، شایسته است به عوامل جغرافیایی توجه بیشتری شود. 1Student of PhD Geography and Rural Planning, Ferdowsi University of Mashhad. 2Associate Professor, Department of Geography University of Mashhad. Selected appropriate cropping patterns, especially high-value crops such as saffron, shows that the pattern of cultivation of these crops can facilitate the achievement of the objectives of rural development programs. In recent years, saffron cultivation considerably has been increased in parts of the city of Nishapur like Isaac Abad district which altered the pattern of crop cultivation from onion to saffron cultivation. The purpose of this study was to identify factors that influence the development pattern of saffron, and the economic and social consequences of the mentioned districts. This study was conducted based on library information and field collected data. A random sampling method was used. The sample size was calculated using Cochran equation, the number of calculated samples were 220 Isaac Abad district saffron grower. Data was analyzed by Pierson Correlation methods. The results showed that geographical factor and attractions in the consumer market were the most important factors in the spread pattern of saffron cultivation in the region. In order to maintain the local potential is also planning to expand the crop pattern deserves more attention to geographical factors. Agricultural Organization of Khorasan Razavi. 2012. The eighth leaf. Journal News No. 7. Alizadeh, A., Sayari, N., Ahmadian, J., and Mohammadian, A. 2009. Examining the best time saffron irrigation in Khorasan province. Journal of Soil and Water (Agricultural Sciences and Technology) 1:15-45. Bidyut Kumar, G. 2011. Determinants of the changes in cropping pattern in India: 1970-2007. The Journal of the Bangladesh Institute of Development Studies 34 (2): 109-120. Bhat, M.M., and Shah, A.R. 2011. Recent changes in cropping patterns and its impact on output of food grains and non-food grains in Uzbekistan. Research Journal of Agricultural Sciences 2 (2): 384-387. Ebrahimi, M.S. 2012. Rural Development Administration. Publication of Amookhte. Faraj-Zadeh, M., and Mirzabyaty, R. 2007. The feasibility of saffron cultivation in lowland areas prone Nishapur using GIS. Journal of Agricultural Science 50: 67-92. IFAD, 2008. The role of high-value crops in rural poverty reduction in the Near East and North Africa. Near East and North Africa Division, Program Management Department. 26p. Khaledi, K., and Haghighat Nejad Shirazi, A. 2012. Economic growth, agriculture and rural poverty in Iran. Quarterly Journal of Social Welfare 12 (46): 58-81. Khalili, N., and Zibayi, M. 2007. The effect of modern technology, seed research on rural poverty, Selected Proceedings of the Sixth Conference of Agricultural Economics, Mashhad, 30-31 November 2007, p. 133-345. Paspan, F. 2006. 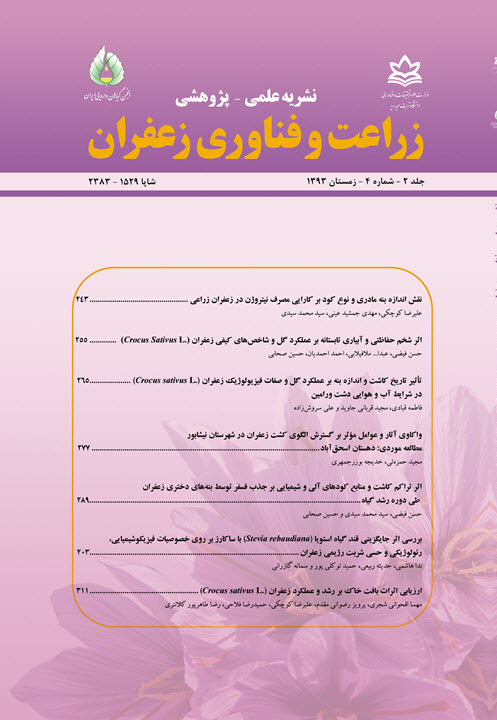 Survey factors affecting the export of Iranian saffron. Journal of Economic Research 6 (2): 1-15. Sam Maghimbi, A. 2007. Recent changes in crop patterns in the Kilimanjaro region of Tanzania: the decline of coffee and the rise of maize and rice. African Study Monographs, Suppl 35: 73-83. Sharma,V.P., and Dinesh, J. 2011. High-Value agriculture in India: Past trends and future prospects. Indian Institute of Management 380-385. Swagata Choudhury, S.K. 2003. Cropping pattern change analysis and optimal land use planning by integrated use of satellite remote sensing and GIS a case study of Barwala C.D. Block, Panchkula District, Haryana, Indian Cartographer p. 111-123. Wallace, H. 2002. Agriculture as a tool for rural development: Workshop Proceeding, Workshop Held in Collaboration with the National Rural Development Partnership on August 24, in French Lick, Indiana. 40p. Zare, SH., Mohammadi Nikpoor, A., and Zarifian, R. 2007. Working with the aim of developing strategies to extend the cropping pattern in Saifi area cultivated forage crops and oilseeds, Iranian Conference of Agricultural Economics, University of Mashhad, 30-31 November 2007.